It’s a familiar story seen and heard in mountain towns all over the West. People from all over the country discover their wanderlust and passions for outdoor adventure, often chasing those dreams to the crags, peaks, and powder of the American West. Often, these dreams are pursued as a way of life, with the comforts and material possessions of modern life forsaken so that the individual may spend as much time pursuing the passions to satisfy the soul. 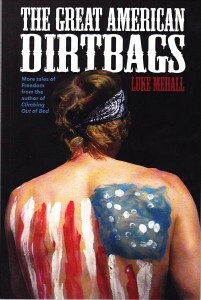 Author Luke Mehall presents an often hilarious, sometimes contemplative, but also spot-on collection of tales and essays in his pursuit of climbing Nirvana, relocating from the flatlands of Illinois, to the lofty environs of Colorado so that he may live the “dirtbag” existence in his twenties and thirties. Mehall’s definition of a “dirtbag” will ring true as being “she or he who spends their days in the outdoors, engaged with some recreational activity, and works just enough to pay for their basic necessities of a dirtbag existence.” Sound familiar? Mehall details his upbringing in the flat Midwest, and his use of any and almost all mind-altering substances as being his main recreational pursuits. He eventually discovers climbing and pursues his passion to his adopted home of Colorado, and spins tales of adventure, misfortune, and discovery to all of the best places to pursue climbing in the west including Yosemite, Red Rocks, Southern Utah, Joshua Tree and south of the border to Mexico. Mehall recollects on his early days of climbing with childhood friend “Two Tent Timmy,” a fearless and strong climber who gave him inspiration only to see the friends drift apart and reconnect later in life over climbing. The essential road trip stories that he undertakes in his “Freedom Mobile” a 1998 Mazda he has painted with the stars and stripes (“do you get pulled over a lot? Asks a gas station attendant) are recounted with the fond recollections of wanderlust, cautionary tales, interesting people, and funny tales that are sure to accompany any extended venture when traveling by car around the West. Mehall’s easy style makes the book hard to put down, as almost everyone can relate to his words in someway. The ending is all too familiar to most of us however, and Mehall provides the inevitable disclaimer in the introduction. “Eventually I changed my ways and was drawn back into a more domestic middle class existence, with a bed to rest my head upon, and a desk to write on.” Often true- but his memories will surely spark you to recall your dirtbag existence whether it for a one summer or winter, or a way of life for several years. September 10, 2014 in Climb.